A rant, a recipe, a result! It’s two years since I quietly entered the blogging scene and in that time, sadly, I’ve become increasingly cynical and critical of the celebrity chef movement. Always curious to see what’s happening in food trends my cookbook library is continually expanding, but the difference between now and before I began blogging is that I’m actually cooking from them. I’ve been a food tragic for forty plus years, and for a big chunk of that time I was a poorly paid, untrained, passionate professional chef. I’ve worked in kitchens with all types of personalities, highly trained experienced cooks and enthusiastic, dedicated amateurs, apprentices who inspired me with their edgy ideas and some who just came to work just for the pay packet. I simply cannot see how the process that the media has formulated to elevate a young relatively inexperienced person to the status of “Masterchef” can ensure that they are a consistently good cook with ideas and technique we should aspire to emulate. I’m not being personally critical of these young people, most are intelligent, incredibly enthusiastic and have camera charisma in spades, but I question the media, those in glass towers who mistakenly see marketability and the size of their burgeoning bottom line as the reason the foodie public should all be putting time and hard earned bucks into a bunch of nice ideas published in a book. It looks to me as if the test kitchens and recipe writers are cutting corners and marketing oversimplified dishes as quick and simple, when with just a smidge of extra attention to the detail in the recipe writing and cooking technique would elevate a nice dish to the sublime. Blogging is the grass roots of the food media. We have the power to right these wrongs. I urge you all to cook critically from your bright new cookbooks, to try recipes that appeal to you, but also to appraise the ingredients and their quantities, the cooking method and times, the flavour, texture and appearance of the finished dish. Consider reinventing a dish, adjust the ingredients to suit availability, budget and your palate. You’ll then be well on the way to being a true master chef! I keep a note book on the kitchen bench and I also annotate my recipe books in black lead pencil. I find following recipes slows me down and distracts my creative thought processes, but I will generally cook a recipe verbatim once, to give it a trial run. I’m inspired by new ideas and as I prepare new dishes I make notes regarding improvements and options I think could improve the dish to suit me better. I don’t just alter recipes for the thrill of it, but sadly, there have been many cookbook recipes lately that have fallen well short of expectations. This brilliant idea comes from Adam Liaw’s “Asian After Work “. I found several false leads the first time round. I have made the ingredients list clearer and I have adjusted the seasoning. We also preferred the flavour using Adam’s alternate poaching liquid, clear flavoursome homemade chicken stock. My one significant change to the method made a huge difference to both the handling and look of the finished dish. I spent one extra minute in preparation to make these changes. The dish is still quick and simple, as well as being delicious. Using a boning knife, remove the bones from the underside of the pork belly then cut off the rind with the layer of fat below. You could make pork scratchings with the rind and save the bones for stock. Your butcher may do these first steps for you if you ask nicely. Use a very sharp knife to cut the pork belly into thin slices. Cut the base off the cabbage, then separate the leaves. Wash and dry the leaves thoroughly. Mix the salt and 5 spice powder together. 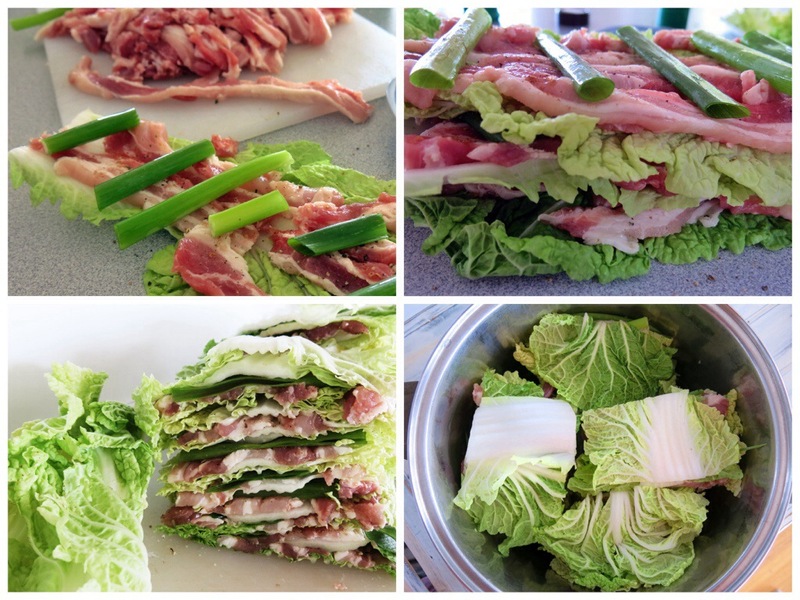 Place one of the largest cabbage leaves on a cutting board, then lay several strips of pork belly in a single layer along the leaf. Sprinkle with the salt/spice mix and a good grinding of pepper, then lay pieces of spring onion across the leaf. 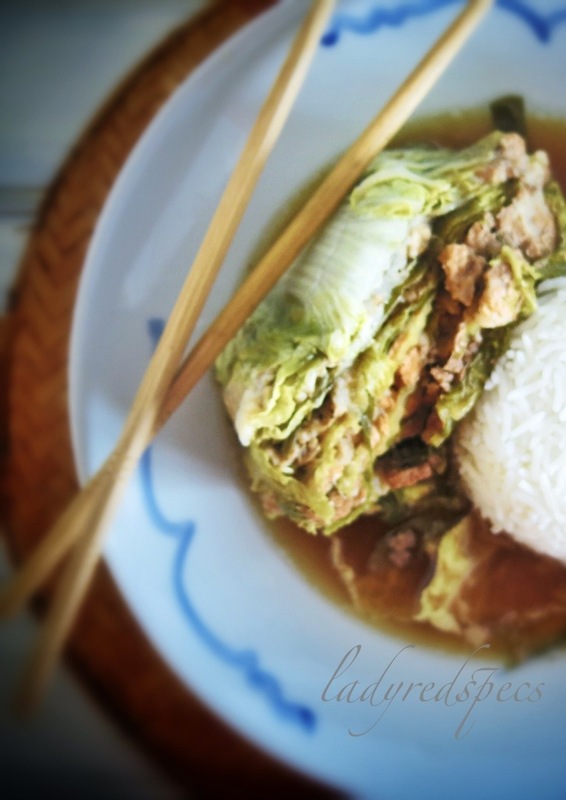 Place another cabbage leaf on top with the stem at the opposite end to the first leaf then add more pork, seasonings, spring onion and another leaf. Continue to layer the ingredients until the pork is finished. As you get to the smaller leaves, use two laid end to end and alternate the stem positions. Finish with a cabbage leaf layer. Lightly oil a large saucepan. Cut the cabbage stack into 4 thick sections and put them into the pot. They should fit tightly. Pour the chicken stock over the cabbage stacks. Place an oiled square of baking paper over the cabbage and then a plate to weigh down the stacked ingredients and keep the top leaves moist. Bring the pot to the boil. Place a simmer mat beneath the pot and let it bubble over a low heat for 45 minutes. Remove the paper and plate then serve the mille fieulle with fresh rice noodles or steamed rice and the poaching liquid. Master Cook doesn’t seem as glamorous as chef, does it? No it doesn’t, but the reality is there is no glamour in kitchens, just hard work and lots of pressure! I agree completely. 90% of recipes I see in cookbooks and, even worse, in newspapers and the like, do not seem to be even tested once. There are many errors, things that are unclear, and technique that is just not right. I still find recipes that brown meat to “seal in the juices” or that tell you to clean mushrooms with a brush (whereas a simple experiment teaches us that water is fine — and much faster). This recipe seems interesting. The only thing I would change is that I would use those pork bones to make pork stock to do the poaching rather than chicken stock. Hi Sandra, I read this post a couple of days ago in my iphone and had a good laugh. We all love a rant from others as it makes us feel better about our own. I do wonder whether the recipes in all these cookbooks have been tested. They certainly were in in the ‘good old days’. I have a cookbook by a current celebrity and I have found one recipe in his book ‘word for word’ on the Dodoni feta website. It does make you wonder. I also get very pissed off with the extremely bad editing in some books. I have one where the procedure has been copied and pasted from one recipe to another, sometimes without changing the ingredients. I complained to the publisher but got no response. I think we are right to be disgruntled, your examples are appalling. Gone are the days when books held credible information! Well said about celebrity chefs. I find that the first cookbook by one is often good; the rest all but useless. It must really shake the confidence of young cooks who persistently cook meals bur are disappointed with the outcome, believing that because it’s in a book it must be good! Anyone who is serious about cooking needs to learn that the way to use a cookbook is to read through the recipe, follow the instructions for creating the mis en place, the shutting the book and cooking. Too true, but most learn technique from books! This looks delicious….and I second your rant! I follow much the same process as you when cooking from books and find myself disappointed by the big hitters consistently. Hey Sal, glad it’s not just me!! I so agree!!! I love the idea of food blogging as a grass roots movement – reminds me of my 60s rebellious youth! I, too, annotate my cookbooks in PENCIL (the latter a sop to my librarian days and the abhorance of defiling books). Love the recipe, by the way. They say as you age you vicariously relive your youth, is that my problem!! I love a good rant- wish there were more of them. I feel exactly like you: so many recipes in books fall short. I have been attempting to do a Karen Martini recipe for Leah’s blog but I just don’t like the results so far. ( fortunately my hungry adult daughter ate it without complaint. Too many books out there look good but fall short. But… I won’t start. I really appreciate that there are people out there like you, testing things, with experienced palates and an understanding of good technique rather than slavishly following food fads ( sticking in Quinoa and Kale or adding an artisan ingredient or two or some ancient grains and talking a good deal about nothing in particular) Stop me. I feel sometimes like I’m turning into a grumpy old dame, but I get so frustrated! This is a great dish. My issues were quite minor really, it just came at the end of a bad run of experiences with recipes in books that are enjoying great acclaim. This entry was posted on March 13, 2014 by ladyredspecs in FODMAP diet, Food, Gluten Free, Light Savoury Dishes, Main Meals, Pork and veal, Soapbox.